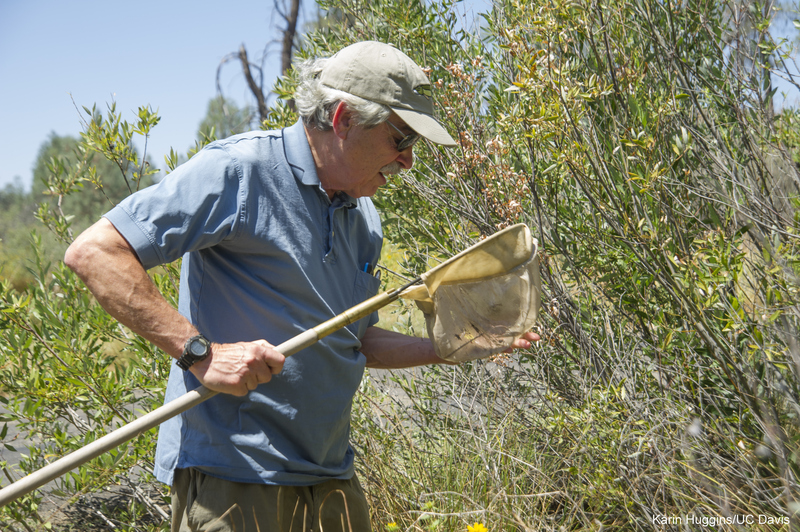 Is the drought hastening the decline of California’s native fish? Will they be able to recolonize once normal conditions return? 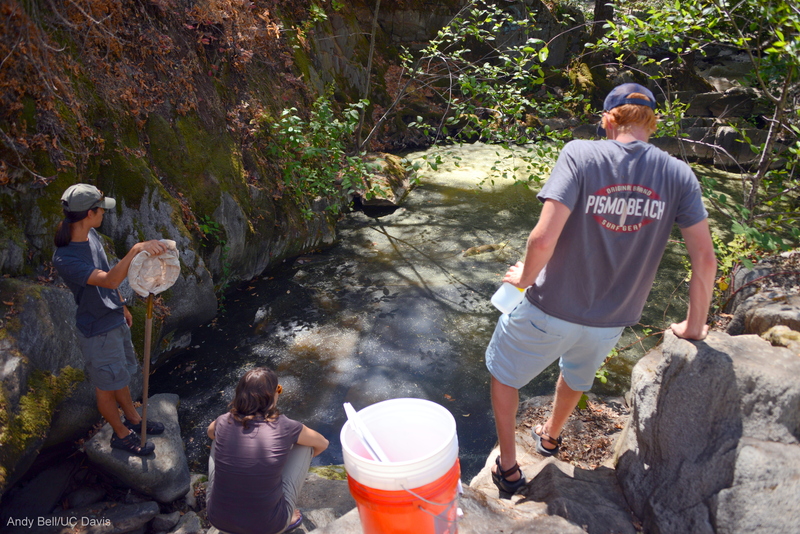 To help find out, a team of researchers with the UC Davis Center for Watershed Sciences are taking the pulse of about 70 streams and rivers across northern and central California this summer, examining habitat conditions and sampling by electrofishing to document the composition and density of fish communities. The selected streams all have data from earlier fish surveys for comparison. Amber Manfree, a geographer with the center, happily volunteered to help the team last week —”What could beat four days of camping and sampling fish in the central Sierra?” She joined project leader Rebecca Quiñones, researcher Andy Bell and student assistants Scott Perry and Cameron Reyes as they examined about a dozen sites in the Tuolumne River Watershed. The group is midway through the summer-long project. Our minivan was packed to the gills with nets, electroshock backpacks, snorkels and camping gear for a fish survey that we expected to take four days. 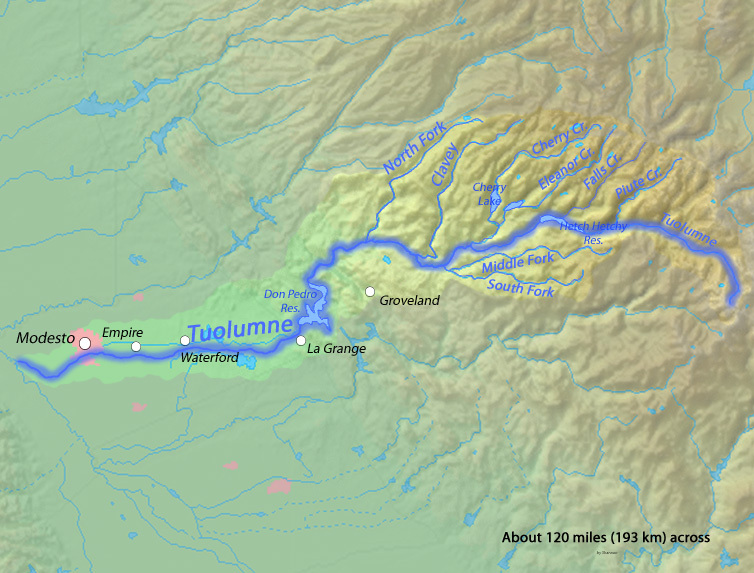 We began Monday, August 11, on the Tuolumne River at the foot of the Sierra, between Modesto and Don Pedro Lake. Don Pedro is the largest of seven reservoirs, including Hetch Hetchy, that moderate Tuolumne River flows and ensure a steady supply to cities and farms even in severe droughts. Little did we know that our fish finds from there on would be so sparse. Farther uphill, near the western arm of Don Pedro, we searched the Red Hills for the highly imperiled Red Hills roach. Yet to be formally described, the minnow species lives only in the tiny alkaline streams of this otherworldly landscape of red dust, bluish forbs, ghostly gray pines and steep rocky hills. A fish would have to be special to get along in a place like this. We soon realized that access to the main stream, Six-bit Gulch, was on private land; we would need permission to enter. Willows shrouded the streambed and from our vantage there was no way of telling whether it had any water. On the way out we debated the odds. The next site was on the Middle Fork Tuolumne River along Highway 120 and just inside the perimeter of last summer’s Rim fire, the third largest wildfire in California history. The road was closed to the public because of potential landslides and falling trees. We asked a worker on his way out if we could get through to the river, but he advised against it. He told us the river was “a mess” — full of sediment — and that a recent storm had turned it the color of chocolate milk. 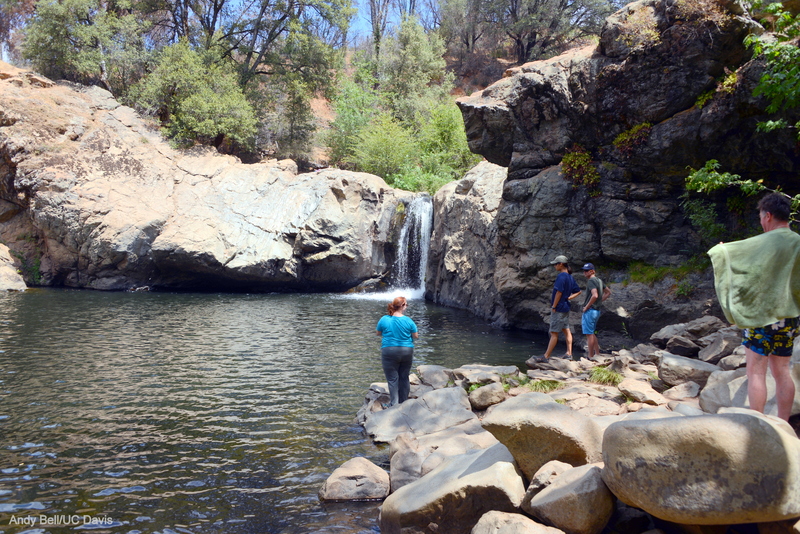 Having been turned away from the Middle Fork, we checked out the nearby Rainbow Pool swimming hole on the South Fork Tuolumne River as a potential sampling site. We spotted several trout from the banks, but electrofishing — passing electric currents in the water to stun and more easily capture fish for our sampling —was out the question with so many swimmers in the water. Families lounged on the rocks and people jumped from the top of the falls. Picnic trash and beer cans were strewn about. A middle-aged swimmer urged us to take a dip: “I’ve been coming here for years and this is the warmest it’s ever been – warmest it’s ever been!” His words rang in my ears as I walked back to the van. 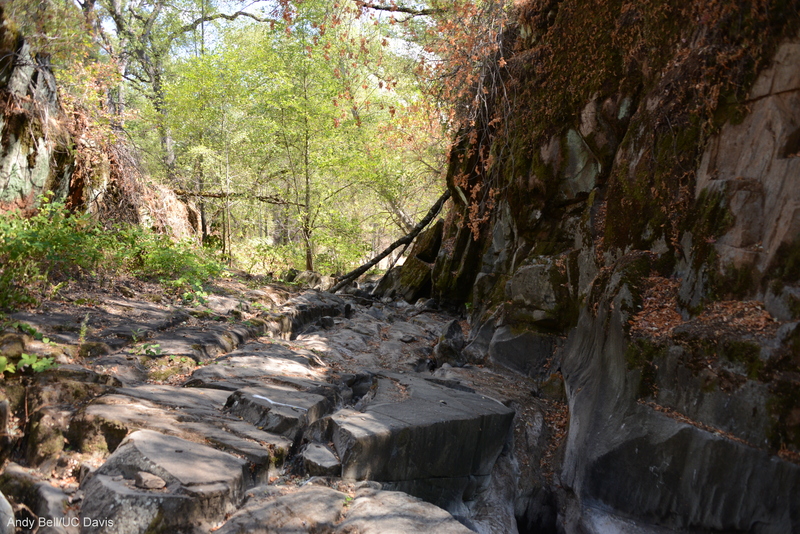 As we moved up the Tuolumne drainage and the creeks got smaller, the effects of drought became more evident. On Woods Creek at Harvard Mine Road near Jamestown, where previous surveys had found dozens of fish, we found only sun-baked bedrock strewn with dry leaves. A few miles upstream at Wigwam Road we found a couple tepid pools crowded with California roach and inch-long Sacramento suckers waiting out the hot summer days. Substantial rains are likely still months away. Until they arrive, the pools will continue to shrink in the summer heat and fish will be increasingly hard-pressed to survive. Almost as soon as we reached our home for the night, Fraser Flats campground on the South Fork Stanislaus River, thunder boomed and dark clouds gathered. Rain might be bothersome while pitching camp, but we hoped some might fall on those dwindling pools with their captive fish. Alas, the clouds soon moved on without shedding a drop. Osprey dived for their dinner in the evening light and the team reflected on the day. We had covered a startling amount of ground, having visited a third of the sites on the four-day itinerary in just the first day. 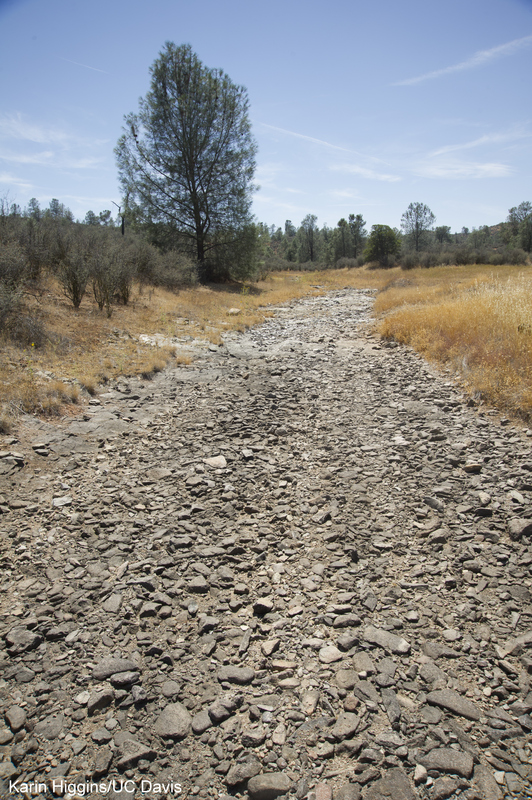 In the Tuolumne River watershed, a convergence of factors endangering native fish was already apparent: invasive non-native fish, sediment-filled runoff following a massive wildfire and severe drought. Together, they can push our native fish to extirpation, one watershed at a time. On the second day, we turned to even smaller creeks on ever more sinuous back roads. Signs urging citizens to conserve water appeared everywhere we went. The old scientific field notes don’t include geographic coordinates, so locating previously surveyed sites was sometimes difficult. Once we oriented ourselves, we found five sites in short order. All were dry. A highway pullout on a grade afforded us a view 50 feet below of a murky green pool in full sun surrounded by heavily grazed oak woodlands. Not promising. Scrambling down the slope, Bell predicted a water temperature of 82°F. On closer inspection we were surprised to find clear, cool water seeping out of a sheer rock face, feeding the pool steadily, if slowly, and supporting an aquatic microcosm of crayfish, dragon and damselflies. One wary fish darted for cover before it could be identified. The bed was lined with thin, fibrous, bright-green algae, but the water was crystal clear and registered 79°F. 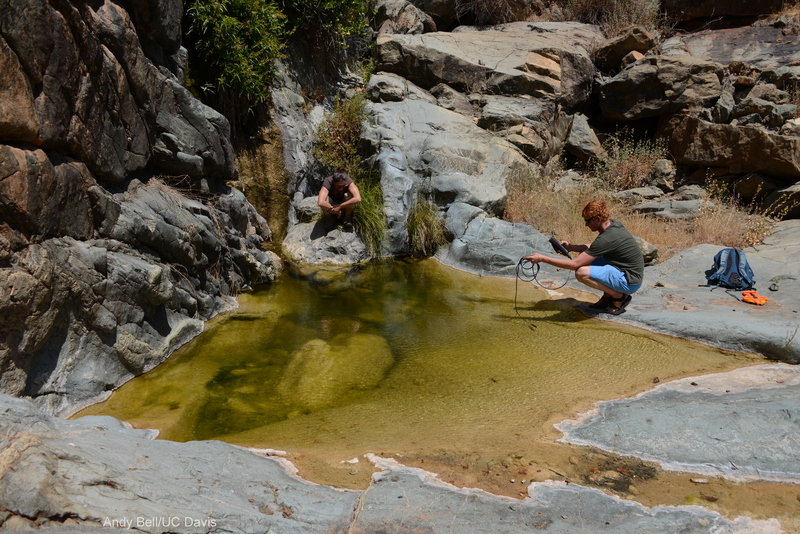 Several other pools just downstream supported a few dozen California roach, as well as bullfrogs and Pacific tree frogs. For the rest of the day, however, we found nothing but dry and nearly dry streambeds. All of these sites had supported fish in the recent decades, as our predecessors noted in their field books. The lack of water and fish left of with little to do. We completed our four-day itinerary by 6 p.m. the second day, save one site that is accessible only by a four-wheel drive vehicle. Eight of the 11 areas we visited were dry – no fish. The ride home was quiet. And the Red Hills roach? It turns out that the private property we couldn’t access – 960 acres encompassing most of the roach habitat – is on sale for a cool $850,000. Quiñones got permission to enter and headed back out Thursday, Aug. 14, this time with Peter Moyle, two news reporters and equipment for transporting the rare fish to aquaria if the situation looked dire. Wherever they could reach the gulch, its bed was dry. But they found a trickle of flowing water supporting some 200 roach in a tributary, Horton Creek – no rescue needed. But the future of the Red Hills roach is by no means secure. Its 4 miles of habitat have shrunk to about 330 feet of functioning stream. Quiñones and her crew will be revisiting the site next month to make sure the fish are still holding steady. If none are found, it will be the first extinction of a species because of the drought and the first extinction of a fish in California since 1989, when the High Rock Springs tui chub disappeared. Amber Manfree is a doctoral student of geography and a researcher with the Center for Watershed Sciences at UC Davis. This entry was posted in Uncategorized and tagged Amber Manfree, Sierra fish. Bookmark the permalink. Fish populations are experiencing considerable stressors. continuing to use electrofishing/electricity only contributes to stress on the fishes. Shouldn’t researchers find a different means of censusing fish condition, given their stated purpose is to evaluate how fish are faring in this prolonged drought? discouraging overall observation we have made is that so many streams that I have sampled in the past are dry or are missing their native fishes entirely.